Troy, New York-based artist Zan Strumfeld has carved her own little niche of winter folk—anthems for the revivalists, lullabies for the lonely, ballads for the hopeful. With a soulful and seductive vulnerability, Zan’s songs of love and heartbreak are complemented by the indie folk/bluegrass sound of her band. 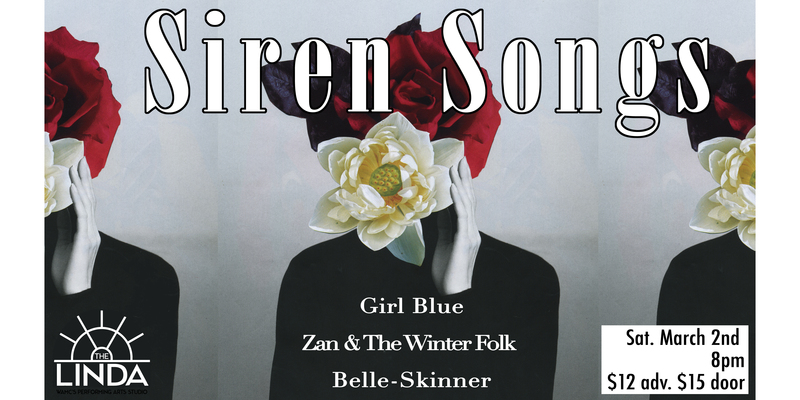 In 2018, Zan and The Winter Folk were named Best Folk Band by The Alt—in their first year as a band. They have opened for acts including grammy-nominated Robbie Fulks, Sean Rowe, Ben Caplan, and The National Reserve. Your Girl No More, their debut EP, was released in fall 2018. Belle-Skinner aka Maria Brosgol is a singer-songwriter, guitarist, and producer based in upstate New York and Brooklyn. With a hauntingly beautiful, lilting soprano and innate sense of melody she crafts tales of songbirds, sirens and desert nomads – nuanced and layered stories which bridge the gap between past and present. Though her influences cover a broad range of genres – from French chansons and Russian folk to contemporary alt-pop and rock – her voice often draws comparisons to the likes of Joni Mitchell, Jeff Buckley, and Angel Olsen. Opening for acts such as Saint Saviour, Bill Ryder-Jones, Joy Ike, Sean Rowe, Mitski, Novelty Daughter, Winterpills, and Heather Maloney, she has performed at venerated venues like The Linda, Rocky Mountain Folks Festival, and the Roundhouse Theatre in London. In 2015 she was a finalist at the Telluride Troubadour Competition; a showcasing songwriter on the main-stage at Rocky Mountain Folks Festival in Lyons, CO; a semi-finalist in The 2015 Great American Songwriting Contest; a finalist in July 2016’s SolarFest Songwriter Showcase; a showcasing artist at August 2016’s MusikFest, the country’s largest free music festival; and a performer at Brooklyn’s famous Northside Festival in 2017 and 2018. In 2013 she was awarded a Maguire Fellowship to study music production in London, where she recorded her first EP, titled Operator. Her self-produced record, titled We Shut Our Eyes, was released in November 2016. She is currently working on her third record and debut album.